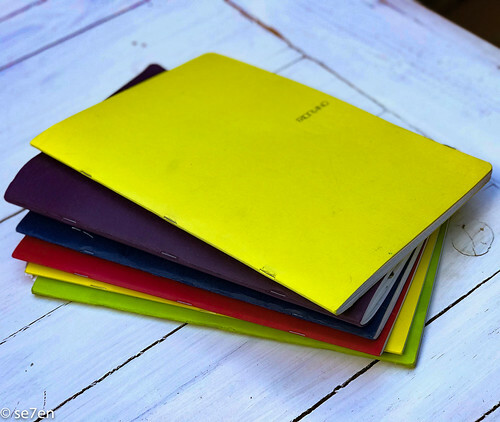 So I am a notebook kind of girl… really I am. 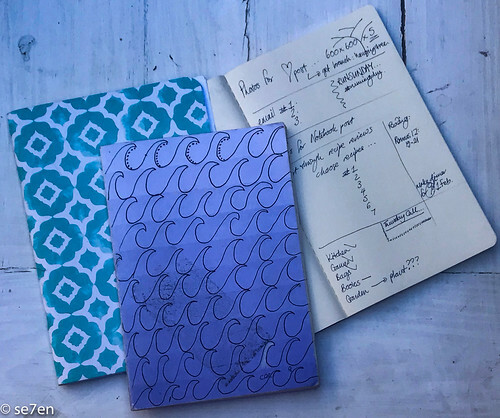 For years I tried to stash it all in one place, but I found myself filling notebooks faster and faster and faster… so last year I split my notebooks up into themes… different notebooks for different things… and it worked for me. I love notebooks, I love doodling and creating and making memories. Some of my notebooks I spend ages on, creating and making… and others well, they are a bit of a scratch and dash… I don’t create notebooks for beautiful viewing, they are tools, some pages turn out beautifully and some don’t. I try and stick to a double spread for the week… this notebook is always open on my desk alongside me for jotting things down. Silly thing: I can really only manage three emails in a day (if not a week)… somehow, they require all my energy… so I only make space for three slots… that’s it. More than that and I leave it till the next day. All my notebooks are A4, except my everything notebook, which is small and I always have close at hand. There are not enough pretty A5 notebooks in the world, I fill them and fill them and fill them. I find that in order to work I need to constantly jot down little reminders of things I want to do, blog posts I want to write out, quotable quotes, sparks of interest… emails that I need to send, meetings that I need to get to. It really is a beginner, beginners kind of bullet journal that I have kept for years. This little notebook helps me to be intentional… when I have done something I cross it out and move on. Of course, lots of things get left undone… but just having this safety net for things that I might forget, gives me a little peace of mind. 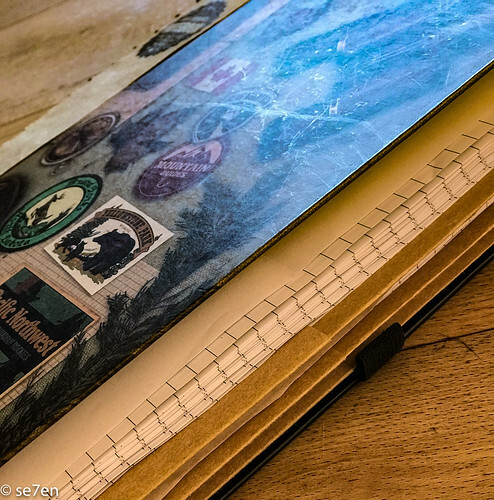 When I finish one notebook, I start a new one and the first page of the next one… I page through the previous books, and carry over all the things that I need to remember from the filled up book. And I am good to go again. 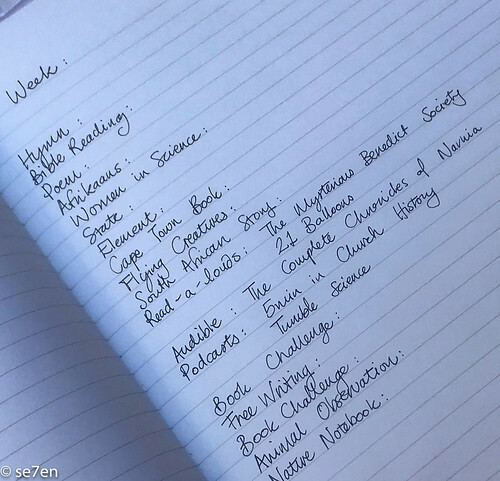 It took me a while to get this notebook up and running practically, that’s because it took me a while to realise that blogging was actual work and I needed to get a plan in place to keep the posts rolling out. I have a fresh notebook like this every year… I start it off by leaving a few pages blank (I’ll come back to those)… and then I stick a calendar into place… on the calendar I pop meetings, and blog posts that I have to write on a particular date and on the facing page, I write down lists of potential blog posts, books I have read, places we have visited and projects we have done, questions folk have asked us and I also I make a list of posts that I have to write for other blogs and commitments to brands we work with. This is really a rather dreamy goal and I never blog all the post ideas that I have (!!! ), the ideas that are great I carry over and the ideas that are, well… ordinary… end their very short life right there on the page. Between each calendar page I leave two or three blank spreads… for blog posts that require preparation and planning. 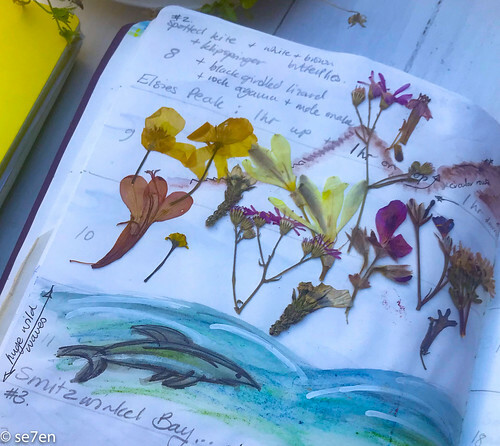 Homeschool posts, seasonal posts, and cookbook reviews, for example, always take a double spread, because selecting workable recipes and shopping lists… So planning pages and if I go to an event or a meeting then these are the pages I write notes on, to prepare my potential post. At the front of this notebook, where I left a few blank pages… I make lists… list of folk I am collaborating with this year, their names (because I am awful at names), their email addresses, and where they fit on the media team. 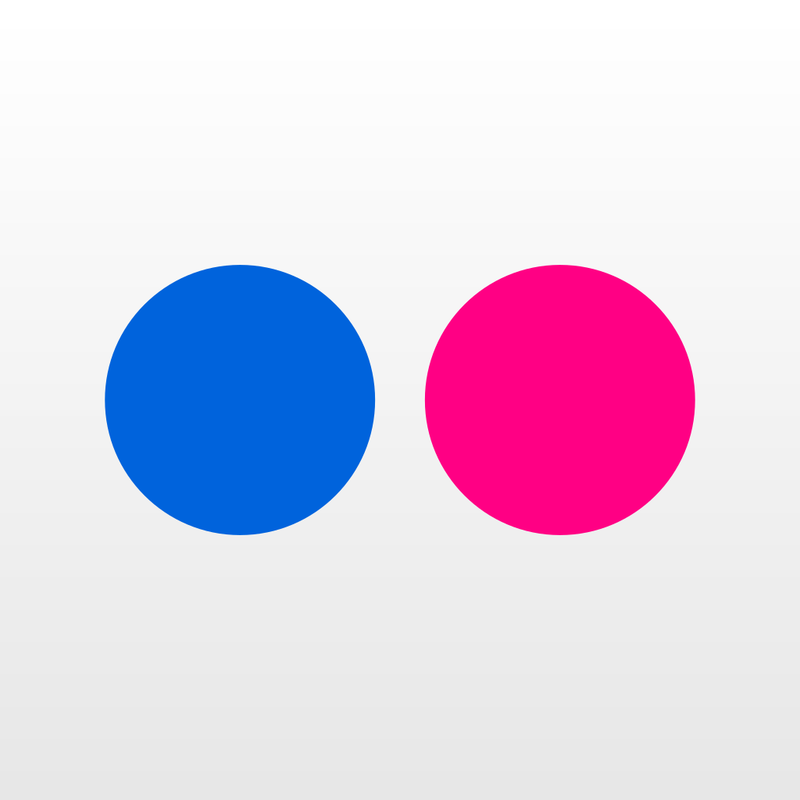 Otherwise, folk that we want to contact or blog ideas… books that we would like to review and so on. This used used to be my big fat notebook that I put everything I needed to homeschool into… but actually, I found I needed somethings from year to year, other things from week to week. And while I had a great big customised notebook, I did have anything to keep track of what we were doing from day to day. 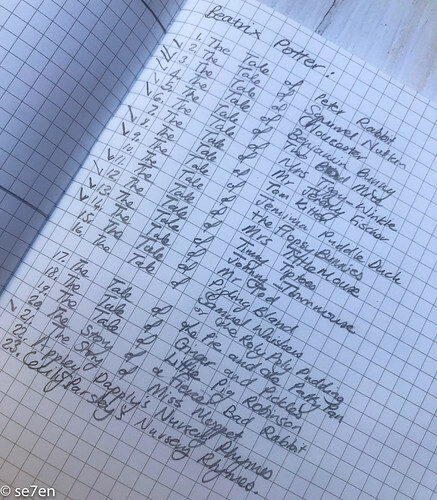 So I split my huge unwieldy notebook into three… The first school notebook that I will show you is really our personal customised list of things my kids have to do for school grade by grade. We are Sonlighters, so the list of books that we need to read through for each grade and also the coursework that my kids will write on their high school transcripts. Don’t worry too much about this book… it is a broad plan, that really helps if you have multiple children, because when you have eight and the oldest one has finished school just as the youngest one begins, it is quite easy to forget the details of a particular year. So while each of my kids does their own school at their own pace, I can quickly refer to my book of school lists and say you need to read this book next, in order to keep their read-a-louds aligned with their history, for instance. Over time I have realised that the school we want to do and the school we actually do don’t always align. I need a place to write a list of all the hikes we want to go on. The year we focused on writing, I want to put all our writing resources and writing ideas onto one page. This is where I write down books that we want to read-a-loud. I want my kids to get used to learning online a little more so every time I see an online learning resource that we would like to try I pop it onto our list. This is where I put potential art projects, cook books we want to work through, people we might want to interview and outings we might want to go on. Otherwise, games that we want to play, projects that my kids want to do… maybe experiments that we want to explore. Some pages, like my Periodic Table page, get turned into blog posts. For example, I know there is a microscope page growing in there and that will definitely be a blog post later on in the year. Lots of ideas in this book get stashed away for later. 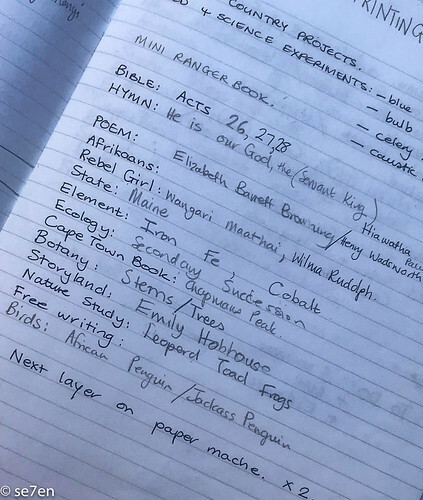 This notebook is a quick reference notebook, I write out the things we might do for the week and then as we journey through the week I pop in the things we have done… this way I know what poem we read last, what chapter we are on in a book and where we stand from week to week. 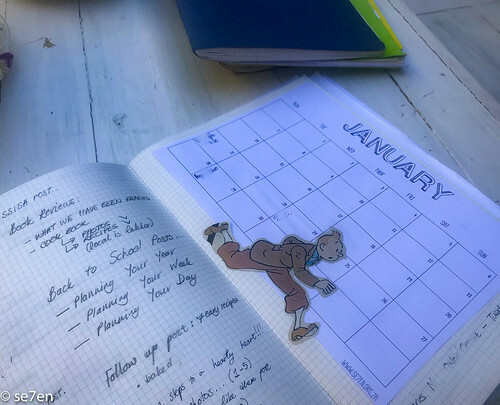 This notebook was a new one last year and it worked so well for us… it is an accountability notebook really. Where I keep track of what we are doing for our family school, (Some folks call it their Morning Basket), what we have read each day and I just fill it in week by week. We needed this, for the student who kept saying we hadn’t read that chapter yet, or I never told them about a particular event we were going on, or we hadn’t listened to that podcast yet… yes, there is always at least one student who claimed that they have never heard mention of what I am talking about… but now I have documented evidence. A very handy book, dated, completed as we go along and there is no escaping what we have or haven’t done. This notebook has dividers in it, just to make it simple to find things, one section has our poems of the week, another has family science, another has free writing ideas and so on. This is the go to, complete book of all the family school we do, the one that maps our family school journey. None of my kids do all the work in this book, they select what they want to remember and share in their own family school journal. Each of my kids has their own family school book, where we keep track of the work we do as a family week by week. 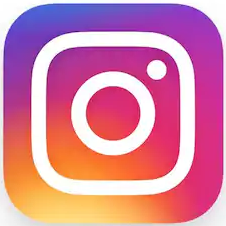 I keep one of these as well. We also record outings in here, and family projects, and this is where we do our weekly free writing. I, just as much as my kids, am learning alongside my kids… in here I might write out our hymn of the week, or our poem of the week. I might write out what we have learned in a history book we have read, or a science book. It is really a reflection of what our family is learning. 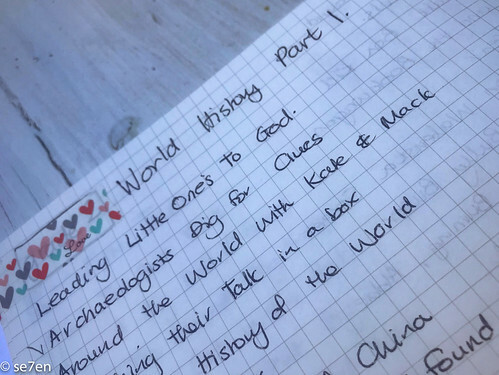 They all have to complete something in their own book from week to week, and they do sometimes want a little inspiration… in which case they can come over to my book and take a peek and get ideas or inspiration to pop into their own journals. 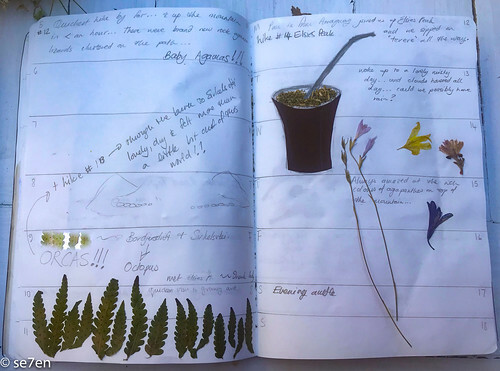 This is my favourite notebook, every time I step outdoors, go on a hike or an outing I gather something, or reflect on something… then I pop it into this notebook… it is really a gathering of nature… it gets fatter and fatter with artefacts as the year goes by. 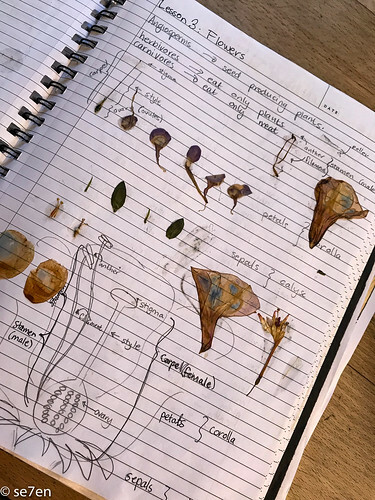 Leaves and flowers that are collected get pressed naturally as time goes by, because I keep this notebook at the bottom of the pile. 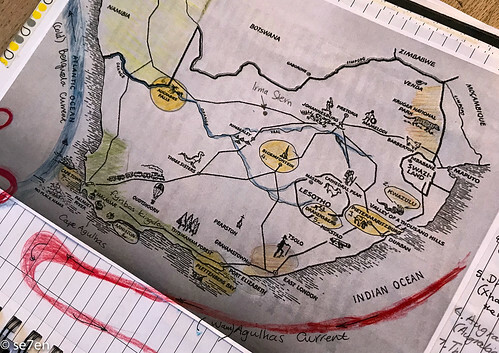 Otherwise maps, the weather and all sorts of things can be stored on the pages… I would love to include photographs, but never print them out… so sketches and watercolours will have to suffice. Isn’t it very much the truth Erin!!! My kids have a week or two before we get thoroughly back into school… until then they are living the dream… beach days and boardgames, audio books and read alouds!!! Gotta love summertime… if it would just get a little cooler it would be perfect!! !